Please list the name you would like on the cape. You may select a NAME or SUPER NAME. Please list exactly as you would like it to appear. We will make size adjustments to the font to best fit the wording on the cape. 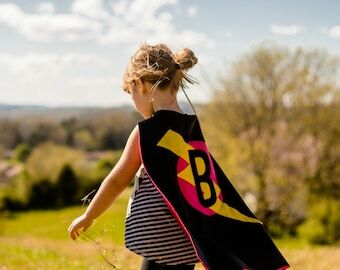 This SUPER Special Star Captain America Style Girls Superhero Cape is PERSONALIZED with your child's name! 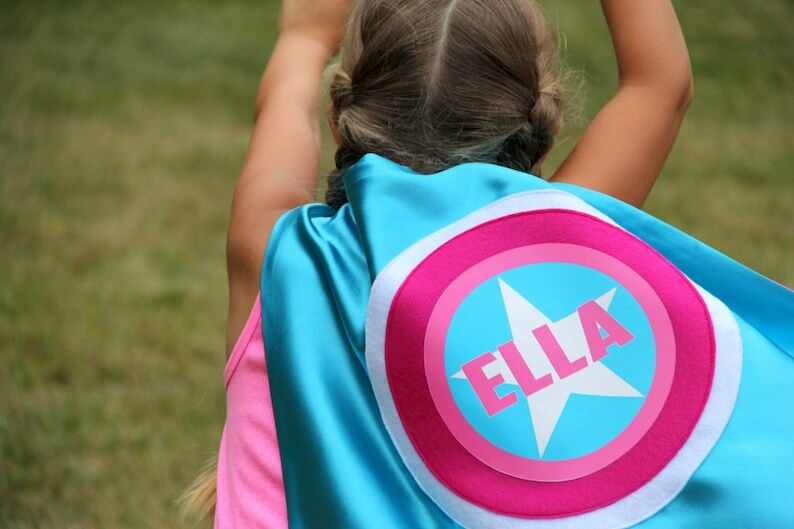 This cape comes in turquoise and pink with a fuchsia, pink, and turquoise design, white star, and your child's name. Option 1:Turquoise and pink cape with a fuchsia, pink, and turquoise design, white star, and your child's name. Option 2: Pink and lime green cape with turquoise, lime, pink, turquoise design, white star and your child's name. Option 3: Pink and purple cape with purple, lime, turquoise, purple, white star and your child's name. Option 4: Purple and pink cape with a fuchsia, pink, and turquoise design, white star, and your child's name. Each cape is made from quality washable satin, double sided with 2 colors. The felt design is made from eco-fi felt and sewn into place securely using high grade sewing equipment to withstand any adventure! Approximately 22 inches long, the safest length for young children. This cape is appropriate for ages 2-8. The neck closes with light weight velcro for safety. The velco is sewn into place to allow for durability. Great birthday present ! Very well made! Granddaughter loves her cape! Very well made !